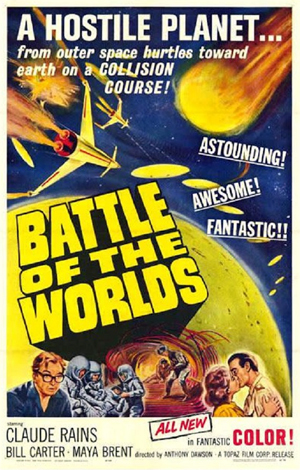 BATTLE OF THE WORLDS—Special Widescreen Edition (1961) Claude Rains, Bill Carter, Maya Brent. This two-disc special edition features a beautiful widescreen foreign language edition with English subtitles on one disc, with the English-language full screen edition on the other. The widescreen edition is a thing to behold with beautiful color and great video quality. The plot is simple but fun: Earth may be destroyed by a runaway planet controlled by a giant computer. Great cinematography with cool special effects and fine outer space scenes. One of Rains last roles. A lot interesting scientific mumbo jumbo adds to the flavor of this action-packed sci-fi classic. Color, 35mm widescreen and 16mm full screen.